New trio CD Humoresque is available now! New reissues of my CDs Window and Door with Bill Frisell are available here. KAFKA ON THE SHORE - Tribute to Haruki Murakami. Nová CD od Venus Records, ji od 17. listopadu na Amazonu !!! Reedice Steve Houben Emil Viklicky Quartet finally available on the web. The concert was a part of the festival of contemporary music called MusicOlomouc 2011. 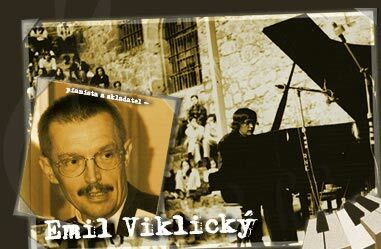 Emil Viklicky's chiming chords and poignant melodic turns on a Moravian love songs had a Keith Jarrett-like eloquence. Combine elements of Bud Powell and Oscar Peterson with a deep infusion of Moravian soul, and you have Emil Viklicky, the patriarch of Czech jazz piano.